A birth chart(One Circle) is created by 10 sensitive points. A birth chart(One Circle) is created by 21 sensitive points. 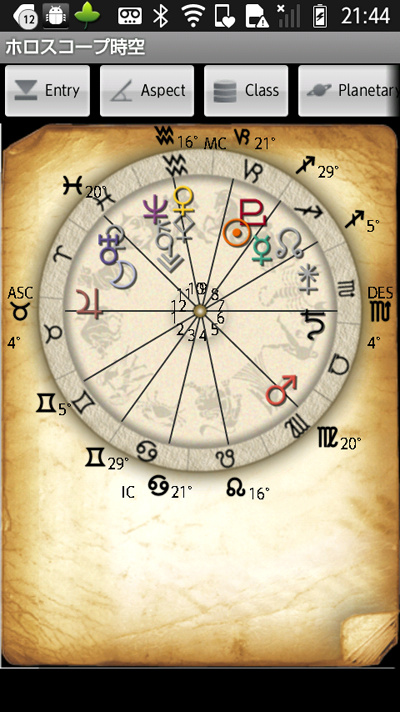 A birth chart(Two Circle) is created by 10 or 21 sensitive points. A birth chart(Three Circle) is created by 10 or 21 sensitive points. A birth chart is created by 10 or 21 sensitive points. The Customer Book manage information of your important customers. 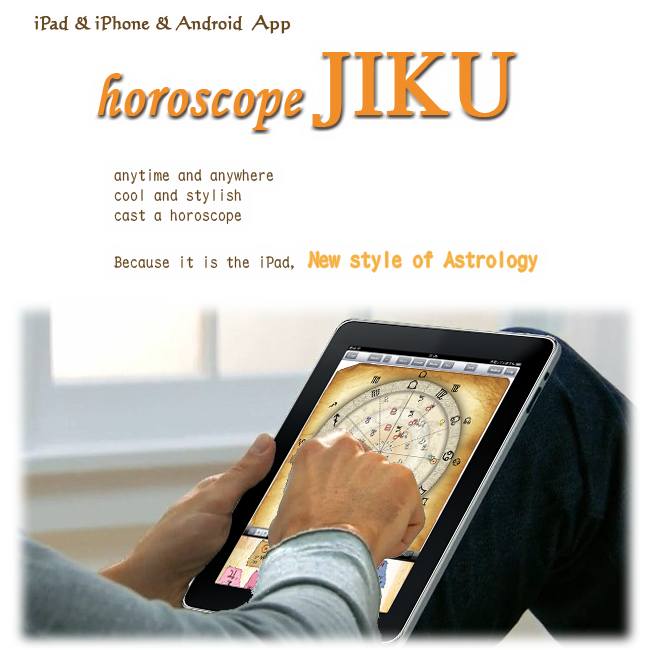 horoscope JIKU has been supported in three platforms. In each platform you can tried a free trial. A compatible option is necessary for optional progress. 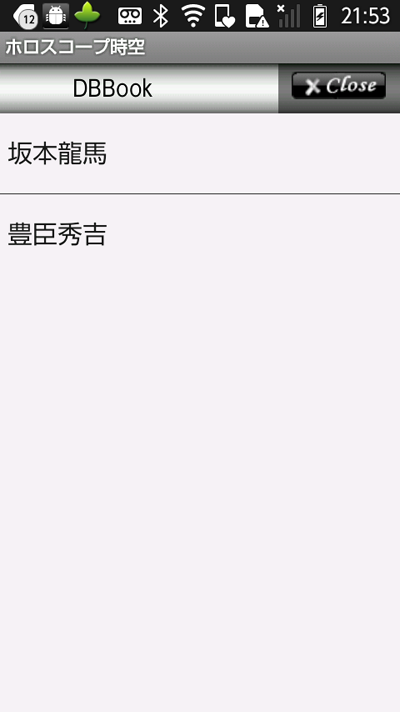 ‘horoscope JIKU for Android free’ can make a real horoscope that is satisfies the professional. ‘horoscope JIKU for Android free’ stimulates your sense of rich beauty horoscope. 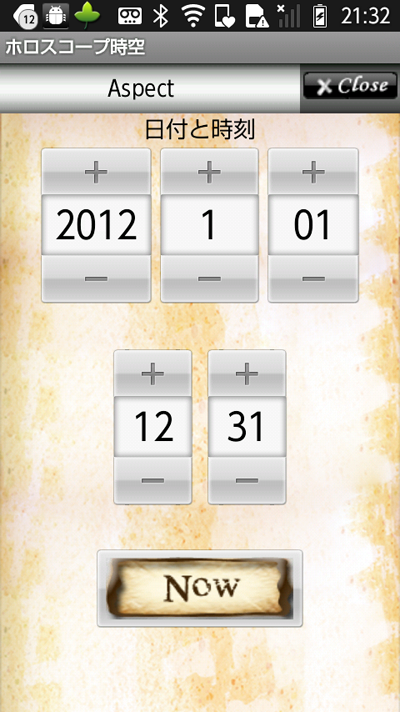 ‘horoscope JIKU for Android free’ is an App for Android. 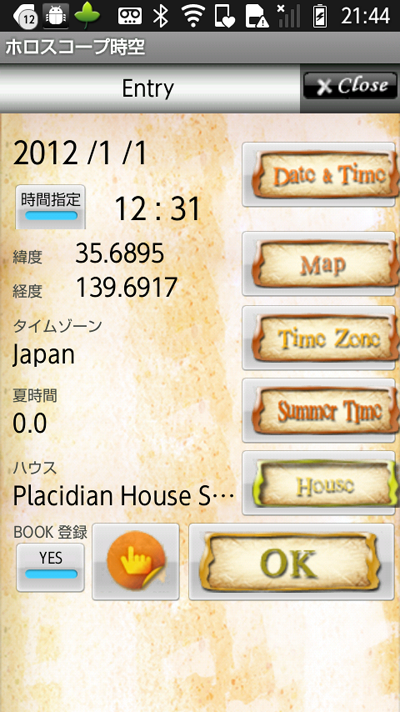 Let’s go out all over the world with Horoscope. ‘horoscope JIKU’ used all over the world is supported in 3 platforms. 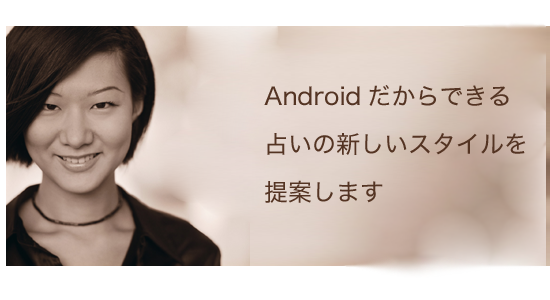 It proposes the new style with fortune-telling because Android is always with you. The App unties you from annoying task that makes the horoscope. You can concentrate on feeling from the horoscope. A horoscope has been drawn to the fact that stay up at that time of the day. The most important thing for the horoscope is how to tell the user the moment. 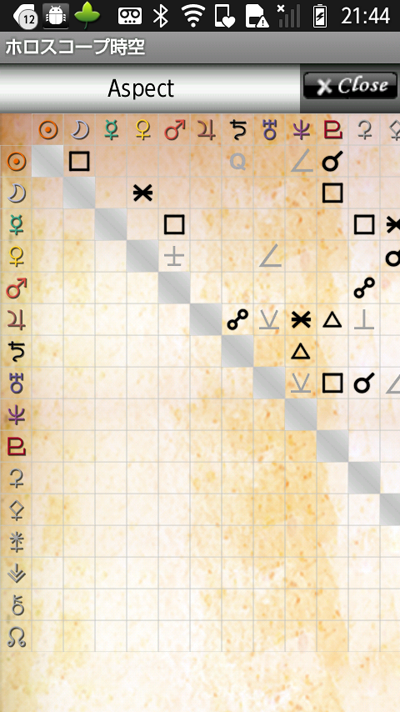 A horoscope drawn by horoscope JIKU stimulates the sensibility of the user by a beautiful interface. Your rich sensibility is that various stories begin to spin it from a beautiful horoscope. An important positional calculation of planets for the horoscope is highly accurate data to be able to answer professional needs. This high accuracy supports the reliability of the fortune-telling by the horoscope. This horoscope answers needs of professionals and fresh persons who stood from the entrance of astrology. This horoscope aims at the App that all people are satisfied. 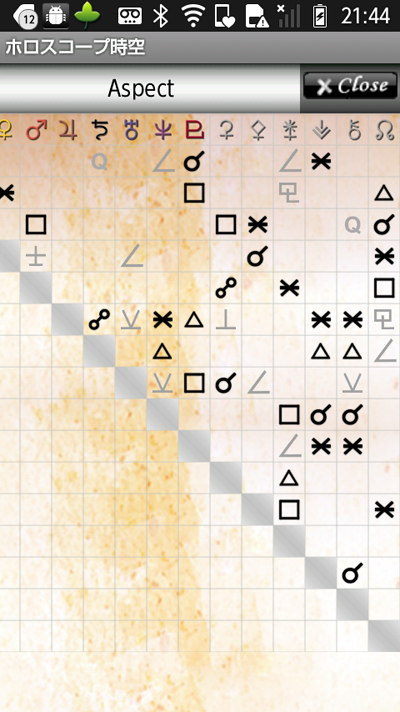 Planets is drawn on a horoscope, an interplanetary aspect is expressed by the table view format. Moreover, the planet on a horoscope is connected by aspect line. The planet is classified each by 2(Duality), 3(Quality), and 4(Element). The position of each planet is expressed at the constellation and the angle in the constellation. 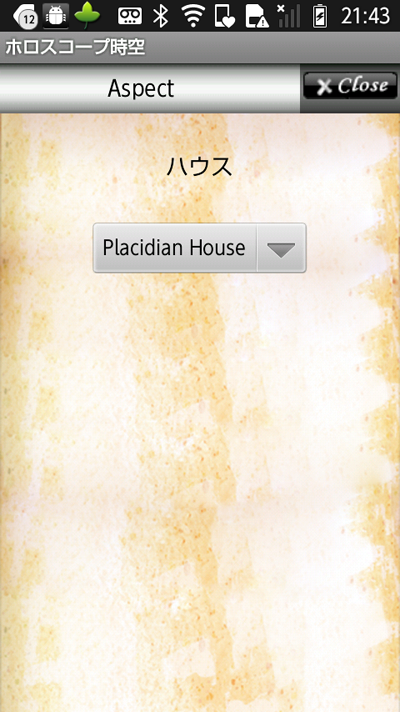 House from 1 to 12 is expressed at the position of the constellation. 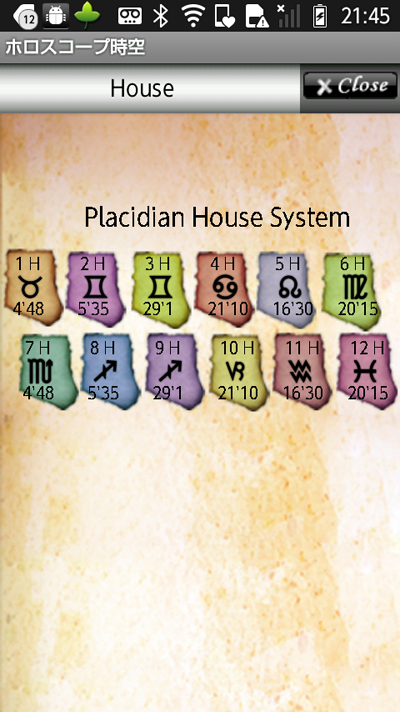 The House System could be chosen the Placidian House, the Koch House, the Solar House, the EqualSign House, the WholeSign House, and the SolarSign House. When (birth) time is a uninput because it doesn’t know time, it is drawn with Solar Chart. 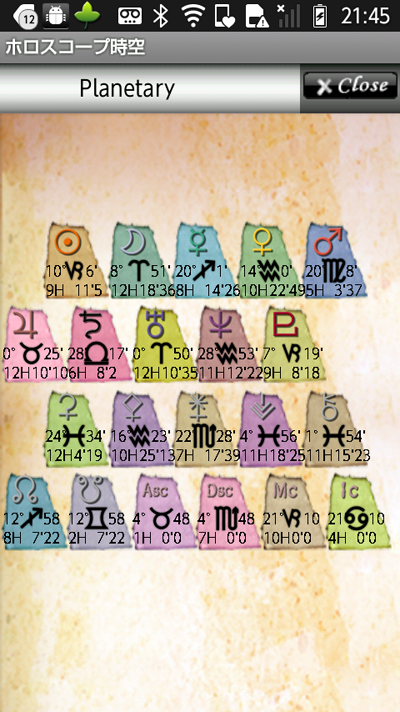 Information on the person who made the horoscope is automatically recorded by the Customer BOOK. 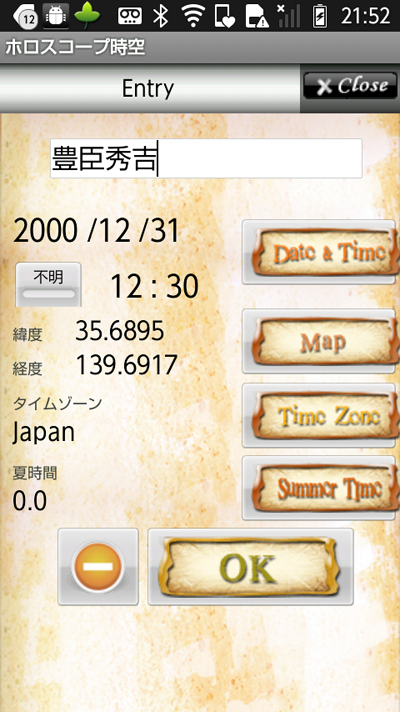 The input of the date is a kind interface to people by 3 methods all over the world. 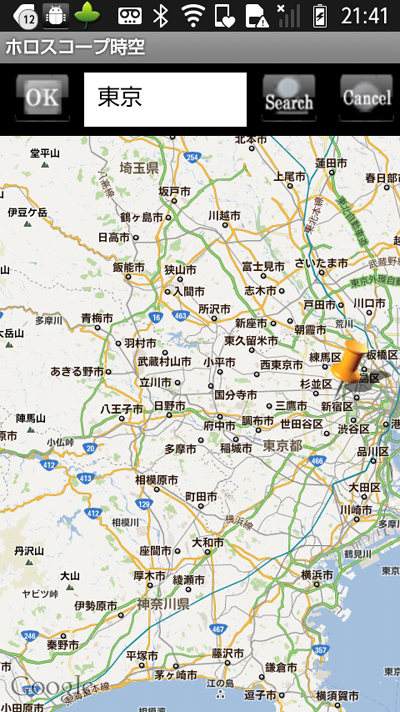 The input of the place can easily do specific at a more highly accurate position with map around the world. It corresponds to the time-zone and Daylight Saving Time(Summertime). 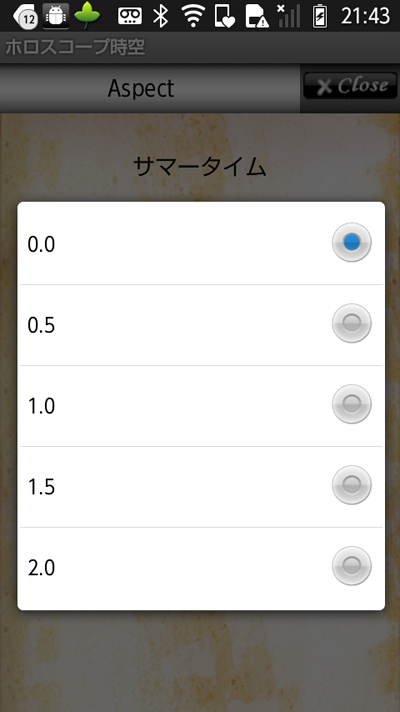 A free version is a horoscope by 5 planets. 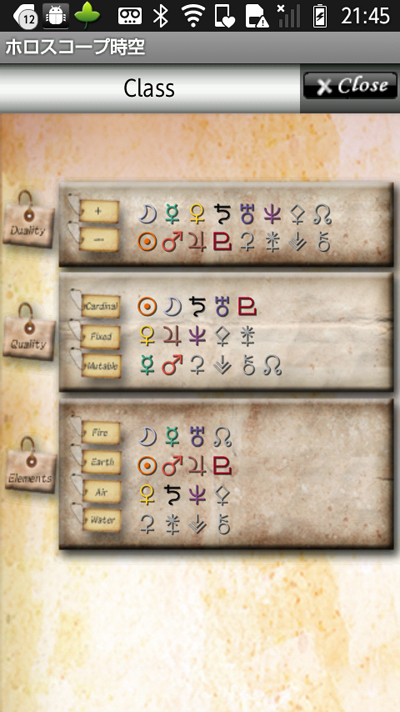 The App becomes a horoscope of 21 sensitive points, 15 sensitive points by planets and the asteroids in the solar system and 6 sensitive points by DH, DT, MC, IC, ASC, and DSC. 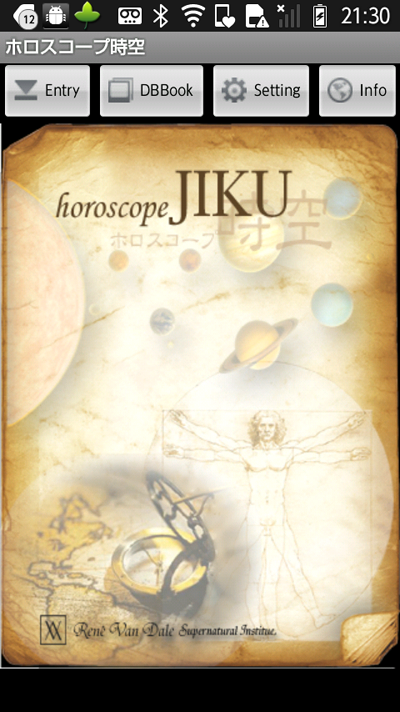 ‘horoscope JIKU’ started from the desire that it wanted to help people for whom Rene Van Dale Supernatural Institue and Interbars Corpration used the West Astrology. Hereafter, ‘horoscope JIKU’ will keep evolving. 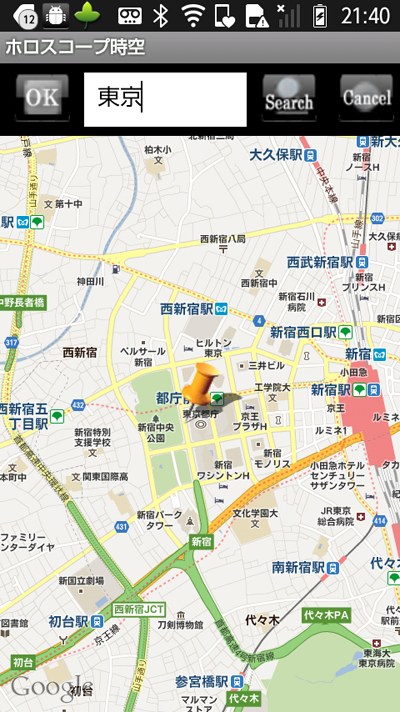 ‘horoscope JIKU for Android’ can make a real horoscope that is satisfies the professional. 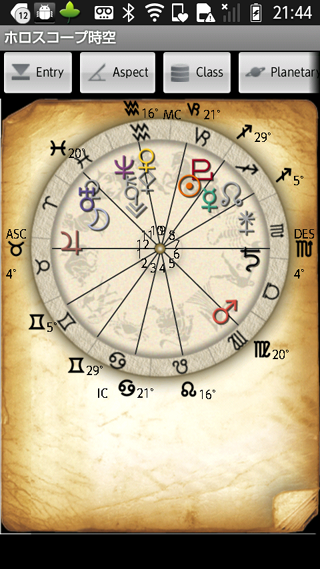 ‘horoscope JIKU for Android’ stimulates your sense of rich beauty horoscope. 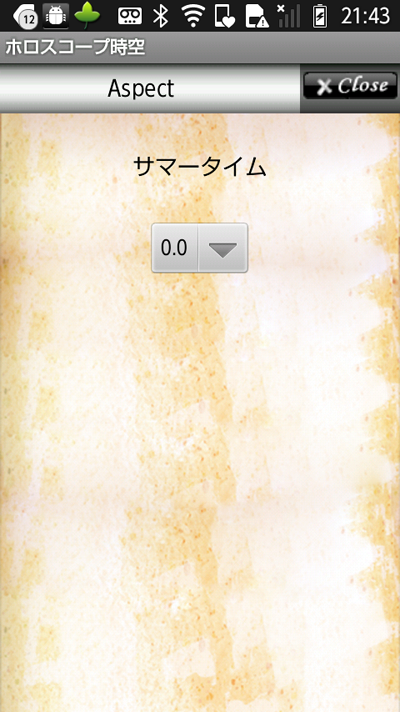 ‘horoscope JIKU for Android’ is an App for Android. 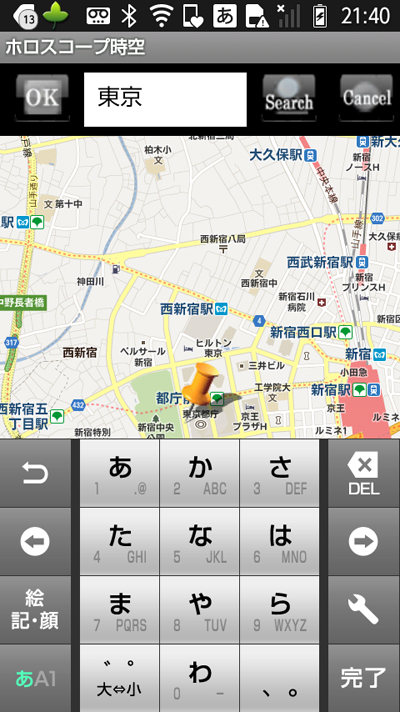 Let’s go out around the world with horoscope JIKU. The App unties you from annoying task that makes a horoscope. You can concentrate on feeling from a horoscope. A horoscope has been drawn to the fact that stay up at that time of the day. The most important thing for a horoscope is how to tell the user the moment. An important positional calculation of planets for a horoscope is highly accurate data to be able to answer professional needs. This high accuracy supports the reliability of the fortune-telling by a horoscope. 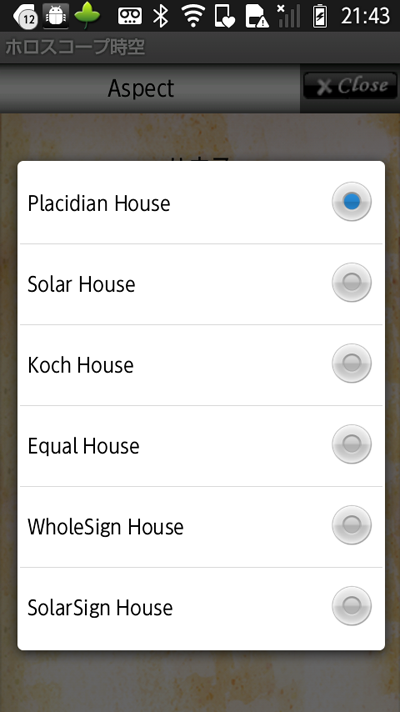 House System could be chosen the Placidian House, the Koch House, the Solar House, the EqualSign House, the WholeSign House, and the SolarSign House. 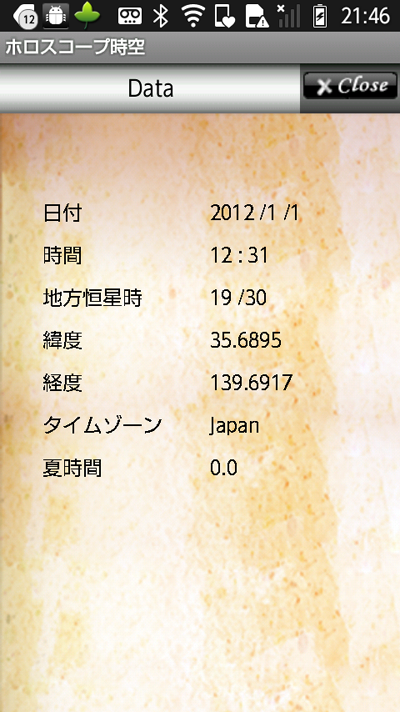 It corresponds to time-zone and Daylight Saving Time(Summertime).